New Features: Two New Options For The Student Monitor! 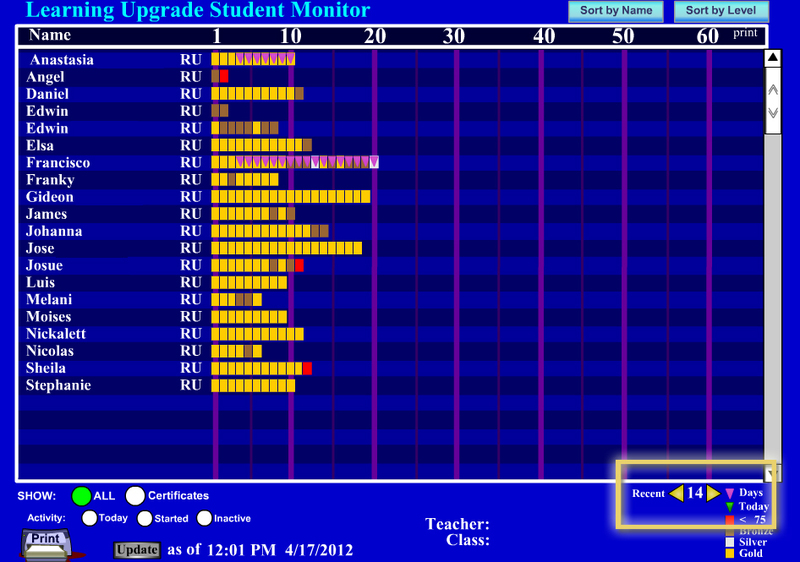 The Student Monitor has been updated and contains two new features. Teachers can now print the Student Monitor straight from Learning Upgrade, and filter student progress by a date parameter. Feature 1: Teachers have been asking us for a way to print the Student Monitor page straight from Learning Upgrade. There is a new print icon at the bottom left hand corner of the page which allows you to do this. Feature 2: The second new feature allows teachers to set a time parameter and view which students have been working on their courses within the set filter. Click on the yellow arrows next to “Recent” to increase or decrease the amount of days you would like your filter to contain. In this example we use 14. When you look at the student courses in the Student Monitor, you will see purple arrows to indicate which levels have been completed within the days you have selected. ← Testimonial: Love your program!